This 90s classic is my wife’s closet favorite movie, like how Rachel Green tells people that her favorite film is Dangerous Liaisons when it’s really Weekend at Bernie’s. I guess everyone needs a guilty pleasure movie to watch by themselves when there’s a bowl of ice cream in front of you and not much else to do. Mine would be First Blood, I’ve watched it a dozen times, and it never gets old. Hers is My Best Friend’s Wedding, and so this time I sat down to watch it as well, knowing that it probably wouldn’t be making its way onto my Top Ten list. But, you know, it’s not half bad, and I think I made a good choice not watching it until now, allowing the 90s goodness to marinade a while until I could enjoy it at its most potent. Julianne is a very successful food critic and writer who has two best friends, both male, one gay and one straight: George & Michael. George is her editor, likes men, likes fine food, is always there to listen, and makes a perfect pal. Michael is a boyfriend from the past, but someone whom Julianne has always loved no matter how much time passes between late night conversations. But things are about to change, and not for the best. Michael met a much younger woman, an heiress to the Chicago White Sox, and is getting married the upcoming weekend. He needs Julianne by his side, but she needs her Michael back, and won’t let another woman steal him without a fight. So she’s off to the wedding festivities to announce her love and to keep her best friend, no matter the cost. There really are some pretty rad 90s time capsule pieces in this film that can be enjoyed 20 years after that wouldn’t have even been noticed at the time. The wardrobe, the cell phones, the cars, the hair; very dated now but very cool then. 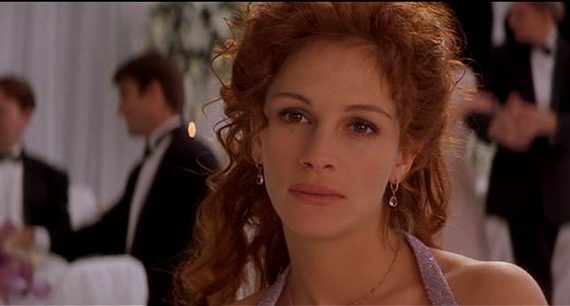 Julia Roberts herself is a bit of 90s nostalgia, and for an actress I have never liked very much, it was good to see her at her best and brightest. The same can’t be said for Dermot Mulroney, who was absolutely abysmal as Michael, but at least filled the role in the way it was intended, if not the way we’d fill it these days. Cameron Diaz and Rupert Everett make the movie though, they really do, adding just enough sparkle in what would otherwise be just another stupid rom/com. All in all, a delightful genre flick; maybe not something to pour over too minutely, not something that’s actually wonderful completely on its own, but a fun time despite its flaws and because of its special, unforgettable moments.